One thing about this recipe is that the amount of yogurt and cheese used will vary depending on the size of the spaghetti squash. I decided to make this because I was wanting something like macaroni and cheese. Then I decided to turn it into a one dish meal. It works very well using some left over chicken and broccoli. Cook spaghetti squash (I usually cook it in the microwave). Fry bacon in pan until crispy. break into small pieces. In a small sauce pan melt butter with the garlic. 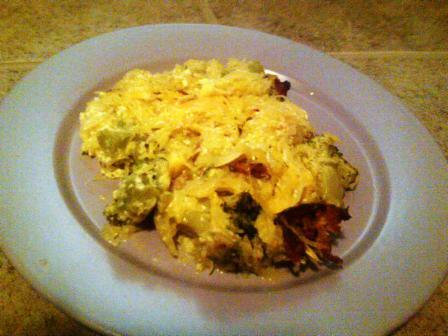 Add cooked spaghetti squash, cheese, broccoli, chicken, turkey bacon, and salt and pepper. Stir until squash is coated with the yogurt and cheese. You could serve it at this point instead of baking, but I had some extra time so I decided to bake it. Place in a baking dish. Sprinkle top with a little more shredded cheese. Bake for about 30 minutes or until cheese is bubbly.